Timex Tourbillon Date Power Reserve Automatic SS/PVC! 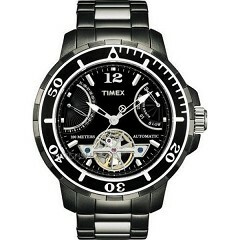 Timex SS Automatic PVC Model Tourbillon Date Power Reserve! Timex luxury power reserve, tourbillon, 38 jewel automatic, T2M516, Black SS case & dial, 100 M divers, Enamel Top Ring, fly back date hand, sweeping smooth second hand, clear display case back, 44 mm x almost 50 mm with lugs & strap with tang buckle (Does not include metal bracelet as shown within Timex stock photo! Expensive & extremely complicated automatic Timex... Sell for $250 or trade! Payment Details: USA Checks OK... Bank Transfers WorldWide!